First Linnaeus studied for a year at Lund University but he moved to Uppsala in 1728. When he arrived there, he found that the medical teaching was not up to much. Of the roughly 500 university students only about ten studied medicine. However Linnaeus did not give up. He wrote Praeludia Sponsaliorum Plantarum in 1729 and many were shocked by his ideas as to the sexual life of plants. 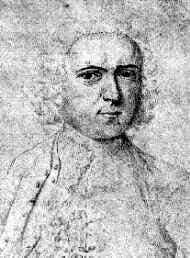 The young Linnaeus, pencil drawing by professor Lars Roberg, Uppsala University, around 1730. In 1732 Linnaeus was sent to Lappland by the Royal Society of Sciences at Uppsala. The Swedish balance of trade was very poor and it was in the country's interest to send a competent natural scientist to search for new commercially exploitable resources. A few years later Linnaeus came to explore the province of Dalarna and its natural resources, including its young ladies! He was particularly interested in a young beauty from Falun – Sara Lisa Moraea. Before he could marry her he had to take his doctor's degree and start earning money. In Sweden at this time it was not possible to take the degree of Doctor of Medicine. Linnaeus had to go to Holland.